MacGregor, part of Cargotec, continues to add to its market-leading Pusnes product range and its latest introduction is a Pusnes RamWindlass. The new windlass is based on a chain-jack design and employs similar technology used in MacGregor's successful range of Pusnes RamWinches. "The Pusnes RamWinch is well known in the industry for its compact size and low weight. It can be found on most of the spar platforms in the Gulf of Mexico and also on several other types of floating production units," says Torbjörn Rokstad, Director, MacGregor Pusnes Mooring Systems. "However, over recent years, market demand has seen the need for an even more compact, chain-jack type design, resulting in the development of our new RamWindlass." Current RamWinch designs have a main cylinder that extends below the winch foundation plates to exert the stroke or 'jacking' movement and each stroke moves the chain two links at a time. 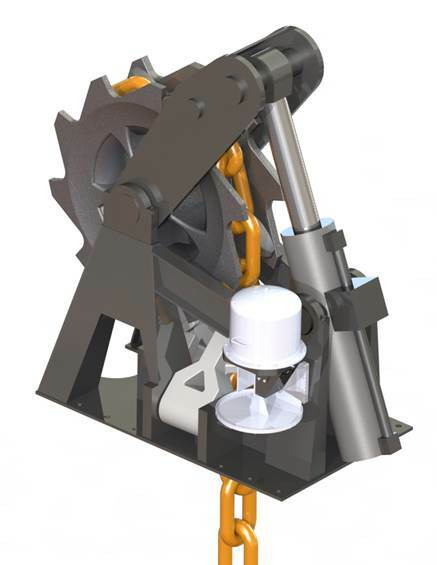 The Pusnes RamWindlass features some significant advances over current RamWinch designs. For example, it locks the chain on every chain link, instead of every second link. Locking one link at a time translates into a shorter stroke for the ram, which therefore requires less space. Also jacking occurs on the cable lifter, not on the chain. "Space is at a premium on floating production units and with the new RamWindlass operators will benefit from an even more compact design, which requires less height clearance in the mooring arrangement," continues Mr Rokstad. The Pusnes RamWindlass has an all-in-one foundation requiring no deck penetration and its simple design leads to low maintenance requirements and high levels of reliability. "Our extensive knowledge and experience of operating Pusnes RamWinches has been an essential part of the design process for the new RamWindlass," adds Mr Rokstad. "All in all there is great market potential for it."